Where should I build my MMA gym at home? What Training Equipment do I need? So you’ve decided to build an MMA gym at home and don’t know where to start, you’ve come to the right place. Whether you can’t find time to visit your local mma gym or maybe there isn’t one close enough to your house, you shouldn’t let anything get in the way of your workout. Building an mma gym at home is a great idea because no matter what time it is, you can get a perfectly adequate mma style workout at home by yourself. If you’re specific looking for just a heavy bag, visit our ‘Best Heavy Bag‘ article. I remember when I first got the idea to put a heavy bag in my garage. It was very exciting but also intimidating at the same time! In this guide we’ll show you how to build an mma gym at home, what products are most beneficial for an mma style workout and how to create space for your workout in the smallest of areas. If you’re looking to get the best home workout, then click on our article to get the Best MMA Workout at Home. This is one of the most important parts of building an mma gym at home. Depending on if you live by yourself or have the wife and kids at home, there will be certain areas you can or can’t build your mma gym. We’ll give you some ideas in this guide that you’ve never thought about. I remember when I first started training Muay Thai, my Brother and I bought a couple of floor mats for kickboxing and set them up all over the garage. The garage is the perfect space for any type of training, whether it be kickboxing or Jiu Jitsu, you’re bound to get a good workout in because of the adequate space. The “grunge” style of training also adds to the look we’re going for here at The MMA Guru. Most home garages (that fit one or two cars) have enough space to set up a couple of floor mats and maybe even a heavy bag. Depending on if you absolutely need to park your car in the garage, this can be a great area to create your own home mma gym. – No noise problems, you can probably blast music out of your garage. If you’re fortunate enough to have an extra room that isn’t used for anything, then by all means use it for your mma home gym. During my senior year of college my one roommate unfortunately dropped out. Luckily enough for me this meant that his bedroom was fair play for my mma gym at home. I was able to set up a couple of boxing floor mats and even a home boxing heavy bag station. The extra room is great if you’re able to transform it into an mma home gym. There are also many heavy bags out there that don’t require you to hang them from the ceiling. – Some extra rooms will already have carpet which is fine for stand-up training. The back porch or patio idea is great because it usually has an open air concept. It can be nice to have this type of gym (especially in a warmer climate) because it can often get hot training inside. Many professional mma fighters believe training in real weather elements is actually better for your overall experience and stamina. Building your mma gym at home on your porch or patio is a great alternative if the others above don’t come to fruition. This is the last room in the house I would ever recommend. It’s almost a certainty that you’ll have to be living on your own for this to work. It’s always difficult when finding an area in the house to build your mma gym at home. However, if nothing above is able to work for your living situation, the living room is always available. My first apartment after graduating college I was fortunate enough to live on my own. This gave me the ability to have “Bob” the human punching bag at my disposal. I hung out with Bob more than I did my own girlfriend. I was able to train with Bob almost every night after work because he was just standing there in the living room waiting for me when I got home. We decided to include some pre-workout products that we find very useful for before a workout. These products are perfect for your home mma gym. 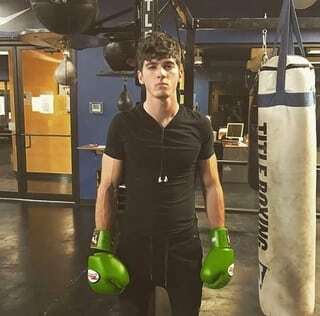 I never just start hitting a heavy bag or rolling with a partner right away, I always make sure my body is fully ready for what type of workout I’m about to endure. These products below will make sure that you’re ready for any type of MMA workout in your own home mma gym. I always recommend starting your workout with a quick 5-10 minute jump rope session. I’ve talked about this in my Best MMA Workout at Home article, this not only gets your body warm and pumped, but it also gives you better flow and timing. Jumping rope has single handedly enhanced my stamina and footwork. This is a great beginners jump rope to use because it is adjustable and perfect for MMA fitness training. The Survival Cross is only $10! With over 4 out of 5 stars, it’s sure to give you a great pre-workout. If you want a more advanced Jump Rope that will last your entire life, then the Buddy Lee Jump Rope is for you. This is the Jump Rope that I have owned for nearly 3 years now. My brother recommended Buddy Lee’s Jump Rope after he purchased one for his mma gym at home. This rope is more expensive than the one above, but it’s quality is unmatched in the jump rope industry. Although we’re going to include kickboxing floor mats later in this article, an exercise mat is a good alternative if you’re not planning on purchasing floor mats. An exercise mat can be used for many things, depending on the size. You can use it for stretching, if it’s big enough you can even use it for stand-up training. This is a great exercise mat for stretching pre or post workout. This is also great for yoga and other activities outside of your mma gym at home. We recommend this mat if you don’t have the need for kickboxing floor mats or tiles. This large exercise mat is perfect for your MMA home gym. This large exercise mat is 78″ Long x 48″ wide (6.5’x4′) x 7mm thick. It includes a storage bag and storage straps. Perfect for cardio, plyometric, MMA, & aerobic workouts. This type of large exercise mat is a great kickboxing mat alternative for your mma gym at home. This exercise mat will allow you to train stand-up and has enough room for shadow boxing. We absolutely had to include the Foam Roller somewhere in this article. Whether it be for pre or post workout, the foam roller is absolutely necessary for all home MMA gyms. This is great for stretching out any type of muscle in your leg or back (which is where a good chunk of MMA style training injuries happen). The LuxFit high density speckled foam roller is ideal for any pre or post workout. This foam roller also includes a 3 year warranty and an instructional video (incase you need one). High density that is perfect for any type of at home physical therapy. This will be a great addition for your mma gym at home. I own this foam roller and it’s absolutely perfect for anyone who does kickboxing or any other martial art. Now that you have all the products you need to get warmed up and stretched, you’ll need some equipment to get a full mma workout from your home gym. Whether your workout includes a Brazilian Jiu Jitsu style workout at home, or an overall MMA style workout at home, your MMA gym at home will be properly equipped after you stock it full of these items below. When I first created my home gym, kickboxing floor mats were the first thing on my list. Having floor mats for mma that allow you to training without worrying about damage to your body is so important. Please take this seriously before training at your mma gym at home, your health and safety should be your number one priority. Perfect for martial arts, lightweight home gyms, p90x, Insanity, gymnastics, yoga, cardio and aerobics. These IncStores tiles are a great and cheap way to cover up anywhere from 24-216 square feet of space in your garage or home office. This kickboxing mat is great for all types of stand-up training, and you can even use it for light jiu jitsu or wrestling training. These are the same mats that I use at my mma gym at home, I absolutely love the color and design, these are very easy to put together or take apart. This mat is absolutely perfect for all types of mma. With such a great design, this can be the center of your mma gym at home. We included a smaller version of this mat above (which was more of an exercise mat), however this version can fully be used for all types of mma. This is the perfect kickboxing floor mat, and a great wrestling mat as well. If you plan on doing jiu jitsu with a partner in your home mma gym, this is the perfect bjj floor mat to use. What would a home gym be without some sort of boxing or kickboxing heavy bag to train on? My first heavy bag was a 50 pound Everlast bag that I bought off of craigslist. It really wasn’t the best bag in the world but I did the best I could with it. I have since evolved and have owned many different types of heavy bags in my day. I will include some of the heavy bags I have previously used in this list, while also including ones that will be the most helpful. I included the Everlast value bundle because I believe it’s the most bang for your buck if you’re a beginner and don’t own boxing gloves or hand wraps yet. If you haven’t purchased boxing gloves yet but would like to, I recommend you visit our Best Boxing Gloves for Beginners Guide. This Everlast stand is great because it can be positioned almost anywhere, and can fit in a small area. This is perfect for a beginner who would like a heavy bag and speed bag combo at a great price. The heavy bag can be used for punches or kicks, while the speed bag will help the timing and accuracy of your punches. The Century Wavemaster training bag has been the forefront of mma home gyms across the world for the past couple of years. I don’t personally own a Wavemaster, but I have used one at a local mma gym. They are great for practicing kicks and give a realistic movement type feel, the bag actually moves (it is called the Wavemaster after all)! I would highly recommend this training bag if you don’t have the ability of hanging one. This is also a great bag because it is easily set up and movable. Having Bob in your life is truly a luxury. He is a training partner, a training dummy, a best friend for some people (sorry mom). I’ve had my Bob unit for almost 4 years now, he’s stayed by my side for the best and worst of times. I absolutely love going into my garage, jumping some rope while my stereo is blasting music, and having a good training session with Bob. He is great for boxing, kickboxing, clinch situations, and I’ve even rear-naked choked him a couple of times (yes I have problems). All and all, I can honestly say Bob is the best piece of equipment I’ve ever bought. I had to include the Aqua training bag on this list, solely on the fact that this type of training is the future. This Aqua training bag is so much better for your joints than traditional training bags. This bag is durable and long lasting, it’s also backed by a two year warranty. You simply fill the bag with water and it’s ready to go, the future is in your own mma gym at home. Available in many sizes and colors, the Aqua training bag is a must have in your home gym. The last heavy bag I’m including in this list is the Outslayer Muay Thai heavy bag. This bag is an absolutely beast for one simple reason: Low Kicks! You can hang this bag up in your garage or any area that will support it, and you’ll be able to be throwing those low kicks in no time. Having a Muay Thai background like myself, I always wanted a bag that would allow me to throw low kicks after combos. This Outslayer heavy bag is absolutely the perfect piece for any Muay Thai home gym. The speed bag is almost a necessity in any home mma gym. The great thing about a speed bag is that it takes up almost no space at all and is such an invaluable piece of equipment to have. I remember the first time I used a speed bag I didn’t understand the concept, eventually I would just try to kick it. However once I was able to put a speed bag in my home mma gym, I felt like Manny Pacquiao (if only). The XMark adjustable speed bag platform is nearly perfect when it comes to speed bag set-ups. The XMark is constructed of heavy Gauge steel to minimize vibration and optimize rebound. The great thing about the XMark is that it’s constructed with a professional grade ball bearing swivel, it feels so smooth, almost like you’re hitting nothing. The Everlast Elite Speed bag platform is a cheaper alternative to the Xmark. This speed bag is nearly as good for half the price. Everlast has been a staple in boxing since the very beginning, this speed bag is a representation of that name. Please be aware that the actually speed bag usually isn’t included with most speed bag platforms. The Ringside Fitness Reflex Bag is absolutely amazing for kicks and punches. This is the perfect standing speed bag for any home mma gym because it’s so easily movable. Ringside Fitness Reflex bag is one of the highest quality speed bags available. This speed bag includes a large base and adjustable heigh. No one said Bob had to be your only friend. A submission dummy would be a perfect companion for Bob when you’re not in your home mma gym. The submission dummy is perfect if you want to practice your Jiu Jitsu through wrestling or grappling. Although it doesn’t move, it’s still an adequate way of training that I’ve personally enjoyed. I prefer using the submission dummy for strictly Brazilian Jiu Jitsu submissions and ground and pound. However anyway that you find the submission dummy to be beneficial is great! The Combat Sports grappling dummy is the ultimate training partner for MMA, wrestling, Jiu Jitsu and submission practice. This life size dummy is perfect for take downs, throws, submissions and strikes. Available in a variety of weights for your mma home gym needs. The Ring to Cage Dummy 3.0 is absolutely amazing for Jiu Jitsu. The 3.0 version is now improved with the addition of hands and feet for all types of newer submissions. With both an adult and youth size to choose from, there is absolutely no reason not to purchase the Ring to Cage Dummy 3.0. This Dummy is able to come shipped filled or un-filled to your mma home gym. Now that you’ve figured out where you’ll be making your home gym, and you have the equipment to fill it up with, what do you do about the walls? In my first home gym I hung up a couple of flags on my walls to represent the cultures that I’ve learned my martial arts from. This included Thailands flag for Muay Thai, Brazilians flag for Jiu Jitsu, and the American flag because I love my country. The Brazilian Flag is hung up in every MMA and Jiu Jitsu gym around the world, why wouldn’t you hang it up in your mma gym at home? The Thailand Flag represents the great nation of Thailand. This flag is hung up in every Muay Thai gym in the world, why wouldn’t you hang it up in your mma gym at home? Last but not least, the American Flag. If you’re like me, you love your country. I always hang my American Flag in my home mma gym. No matter if you’re from Brazil, Thailand, America, or from anywhere else, respect martial arts and the cultures and values that they hold. I hope after reading this article you feel inspired to create your own mma gym at home. I know the feeling, a mix of excitement but nervousness with the hope that everything goes smoothly. The truth is, an mma gym at home can become very expensive if you don’t know exactly what to look for. I hope this article filled you with the knowledge and courage to take on this daunting project! Please feel free to comment below with any questions or thoughts that you may have when making your mma gym at home.